Although debate continues on whether breakfast is the most important meal of the day, breakfast cereal sales keep growing year after year, with $15 billion in revenue expected in 2018. Though cereal is certainly appealing for its quick and easy preparation, sorting through the multitudes of options at grocery aisles can be a tricky task if you’re looking for something healthy. It’s a good rule of thumb to steer clear of artificially colored cereals with cartoon characters on the box, but other seemingly nutritious brands tout misleading claims of wholesome ingredients and other health benefits, concealing some not-so-great qualities, such as excessive added sugar. We chatted with two nutritionists to get some clarity on what makes for a healthy cereal, and asked them to rank the nation’s most popular varieties. Gorin added that ample fiber (at least 3 grams per serving), some protein (at least 5 grams per serving) and a conservative amount of sugar (no more than 4-6 grams per serving) is also ideal. “Protein and fiber help keep you fuller for longer, and we should try and limit our intake of added sugar,” she said. Jonathan Valdez, owner of Genki Nutrition and media rep for the New York State Academy of Nutrition and Dietetics, recommended checking out the total carbohydrates as well, ideally 45-60 grams per meal, to make sure you have enough energy to power through the morning. When it comes to added sugar, less is better, and when possible opt for fruit to add sweetness rather than table sugar, Valdez said. Unlike whole grains, refined grains like white flour and degerminated cornmeal have been stripped of most of their fiber, vitamins and minerals. They are more quickly digested and have a high glycemic index, which may lead to overeating. Those with high blood pressure or a family history of this condition should also take note of the amount of sodium in cereal, Valdez said. Aim for less than 5 percent of the daily value. When looking at a nutrition label, it’s important to note the serving size, which can vary widely from cereal to cereal. Remember that the size of your favorite bowl does not a serving make. Ready-to-eat cereals range from 3/4 to 1 1/2 cups and granolas are usually around 1/3 cup. Below is Valdez’s ranking of these cereals from healthiest to least healthy, with key nutrition facts for reference. Of his top pick, Raisin Bran, Valdez said, “The added sugar is coming from the raisins, versus table sugar. Raisins are grapes and they contains antioxidants.” Froot Loops and Frosted Flakes, the refined grain options of the bunch, are ranked lowest. Gorin’s ranking, though similar, has a few key differences. “Out of these, Cheerios would be my first choice because they have a base of whole grains and are low in sugar,” she said. Frosted Mini-Wheats lands below Honey Nut Cheerios, Cinnamon Toast Crunch and Lucky Charms on Gorin’s list, losing points for its high sugar content. While Raisin Bran has naturally occurring sugars from dried fruit, the second and third ingredients of Frosted Mini-Wheats ― after whole grain wheat ― are sugar and brown rice syrup, aka added sugar. “You can always add forms of fiber and protein to your cereal (i.e. berries and nuts), but you can’t take away the added sugar,” Gorin said. 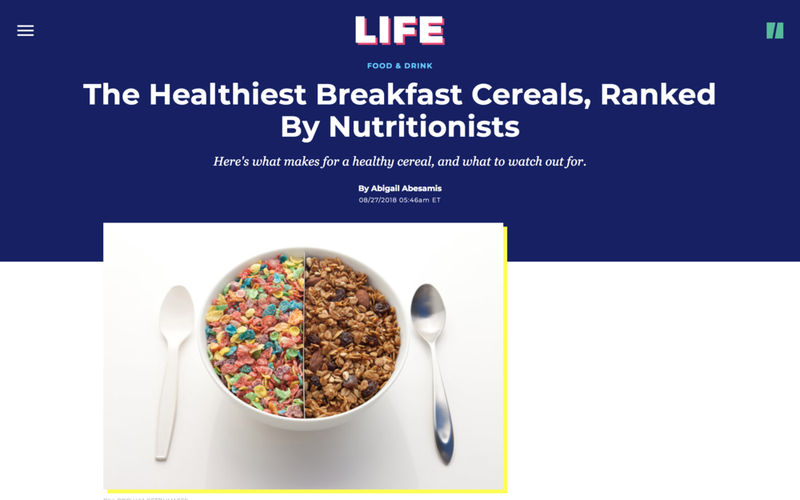 Valdez’s short list includes Special K Protein Cereal, featuring 10 grams of protein per 3/4 cup serving, relatively low sugar (7 grams) and adequate fiber (3 grams). Kashi 7 Whole Grain Flakes Cereal is also on the list, with 6 grams of protein per 1-cup serving, low sugar (6 grams) and high fiber (6 grams). Lastly, Kashi 7 Whole Grain Puffs Cereal has 5 grams of protein per 1 1/2 cup serving, no sugar or sodium and a good amount of fiber (4 grams). No matter which cereal you choose, he recommended complementing it with a few additions to round out your breakfast and reach a target 25-30 grams of protein per meal. This can be achieved by adding a cup of lowfat milk and fruit to cereal, plus three eggs with spinach or other mixed vegetables and garlic (which add fiber and antioxidants).